Asus announced its 2019 lineup of thin and light Ultrabooks at CES 2019, including the ZenBook 14 and the new Zenbook S13. The Asus ZenBook 14 manages to pack the latest Whiskey Lake Ultrabook processors, along with Nvidia GeForce MX150 graphics and up to 16GB of RAM into a svelte, blue chassis that's as thin as it is light. 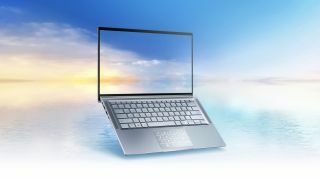 This Ultrabook weighs just under 1.45kg (3.2 pounds), while managing to cram a 14-inch display into a 13-inch chassis. That thin and light Chassis features Asus's Utopia Blue color and the spun metal finish that the manufacturer is known for. And, when the lid is opened, the back will lift up the chassis to give a more comfortable typing experience. There's an extra twist here. The touchpad on the Asus ZenBook 14 manages to double as a number pad, so you can do calculations and spreadsheets, without having to somehow fit a full keyboard on a 14-inch laptop. This is similar to Asus's ZenBook Pro 15, though it's not quite as fully featured – or as expensive. The Asus ZenBook 14 will be available sometime in Q1 2019 starting at $749 (£590, AU$1,060). Asus also announced the ZenBook S13 at CES, with similar specs, but a much more attractive chassis – Asus claims its the world's thinnest laptop with discrete graphics. The Asus ZenBook S13 keeps the same 12.9mm (0.51 inches) thickness of the original ZenBook S, but this time around, it managed to shove an Nvidia MX150 GPU in the mix. This isn't the most powerful GPU on the market, not by a long shot, but it is perfectly capable of light video editing or casual gaming. And, you could easily carry that power along with you, as the laptop only weighs 1.1kg (2.3 pounds). The Asus ZenBook S13 will be available sometime in Q1 2019, though Asus hasn't shared pricing information at the time of this writing.